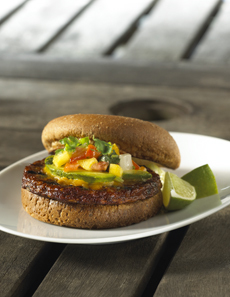 The Carla Burger from chef Carla Hall: a black bean burger with peach salsa. Photo courtesy MorningStar Farms. We love a good spicy veggie burger. 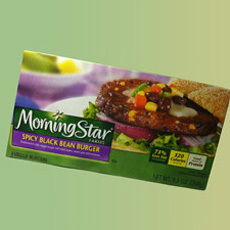 Morningstar Farms makes one Southwestern style, from black beans, corn, tomatoes, bulgur, brown rice and jalapeños (among other ingredients). We often top our burgers with salsa for added spice. But MorningStar’s consulting chef Carla Hall came up with a version—peach pico de gallo—using this season’s sweet peaches, with spicy chiles and tangy lime juice—an easy-to-make burger topping. You’ll only need about a third of the recipe to top the burgers. Serve the remainder as a dip with tortilla chips or thin jicama slices…or the next day with another burger. 1. MAKE PICO DE GALLO. In medium bowl combine tomatoes, peaches, onion, cup cilantro, chile peppers, lime juice, sugar, salt and garlic. Let stand at room temperature for 1 hour. 2. PREPARE GRILL. Meanwhile, spray grill rack with nonstick cooking spray. Preheat grill to medium-high heat. 3. GRILL BURGERS. Grill veggie burgers directly over medium-high heat about 6 minutes or until burgers reach internal temperature of 165°F and grill marks form on both sides, turning once. 4. ADD AVOCADO & CHEESE. Top burgers with avocado slices and the 1/4 cup cilantro. Sprinkle with cheese. Grill about 2 minutes more or until cheese melts. Look for the green box. Photo courtesy Morningstar. 5. SERVE. Move burgers to buns. Top each burger with about 1/4 cup peach pico de gallo. Place lime wedges alongside of sandwiches on serving plates. 1. NONSTICK SPRAY. Spray some non-stick cooking spray on the grilling surface before turning up the heat. It makes flipping your food easier than ever. 2. SALAD TOPPERS. Think outside the bowl! Take your salad out of the bowl and use it to top your grilled burgers. Whether it’s a slaw or Caprese Salad, consider this the adult-version of playing with your food. 3. GRILL EVERY COURSE. Use the grill to take advantage of summer’s wide produce selection. Marinate fresh vegetables in a light salad dressing and grill until tender for a tasty side dish. After the meal, add slices of angel food cake and stone fruit or pineapple to the grill for an easy, crowd-pleasing dessert.